As the Miami Dolphins defense played knock-down, drag-out football versus the always tough Baltimore Ravens for sixty minutes. 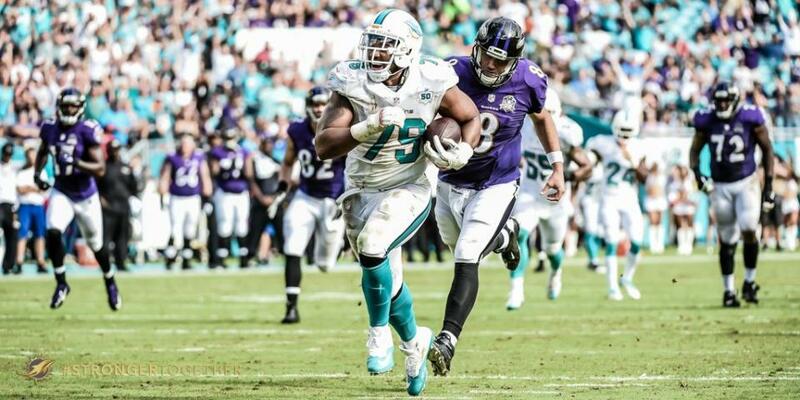 Double goose-eggs were laid at each end of the soggy coop until the play following the two minute warning of the first half, when Miami rookie defensive tackle Jordan Phillips batted one of his season's many balls at the line of scrimmage, and safety Rashad Jones intercepted the ball to give the Dolphins possession at the Ravens forty. 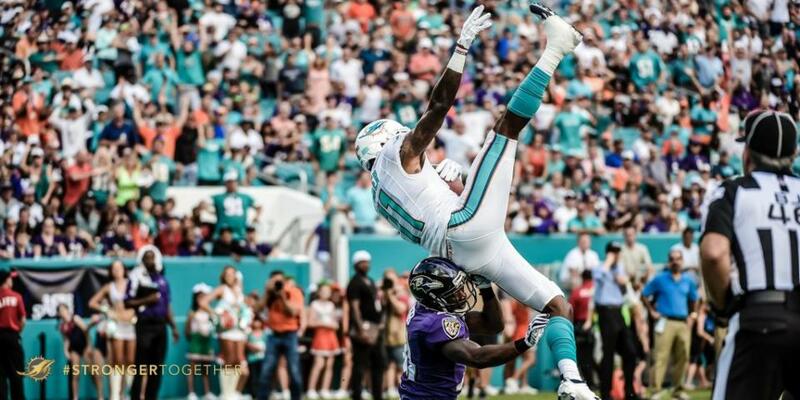 The Dolphins struck immediately on first down with a fifty yard toss through the air that rookie DeVante Parker while in full stride toward the post jumped out of the stadium to snag the perfectly placed touchdown pass. A new "play-caller" (Zac Taylor the love-child of #54 & #99) was promoted this past week and to this point had filled the running game dosage prescribed by tough man Dan Campbell. Twenty seconds later Miami's defensive end Derrick Shelby batted another pass into the stratosphere, tracked it, caught it, and ran it into the end zone for what would end-up being Miami's fifteenth point in twenty seconds. An interception, a forty yard (fifty through the air) touchdown pass, a pik-six, and a two point conversion in this particular games only twenty seconds of great, all around Miami Dolphin football. 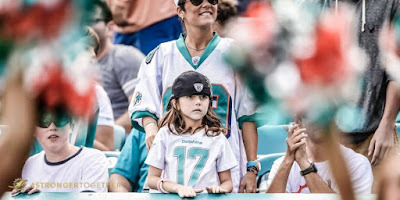 Though the Dolphin defense played good football for the most part of the day, those fifteen points were all that the entire team could muster-up, but that twenty seconds turned-out to be just enough for a Miami Dolphin 15 - 13 VICTORY! The Dolphin Defense offered-up 3 sacks (2.5 via Olivier Vernon), two (R.Jones & D.Shelby) interceptions respectively (on batted balls via J.Phillips & D.Shelby) respectively with the second going for the Shelby-Hat-Trick-bat-pik-six-interception-touchdown. Miami allowed 281 passing, and 94 rushing yards. Safety Rashad Jones came into the game as the leagues only 2015 player with 90 plus tackles along with 3 interceptions, and he converted that fourth interception today. Miami's pass offense was stagnant other than on a couple handful of plays. Three of those significant plays came via the (draft time suggested) athletic skills, speed, hands, and length that DeVante Parker provided. Along with his second consecutive weeks touchdown he made a nice sliding third down and long catch for a first down that kept the clock running on the Dolphins final possession while leading the receivers with 63 yards. Ryan Tannehill acknowledged ""yea, we weren't efficient in the pass game. We didn't make enough plays when we had the opportunities, we have to be cleaner in the pass game, and I have to complete more passes when we throw it""
Which is absolutely true! 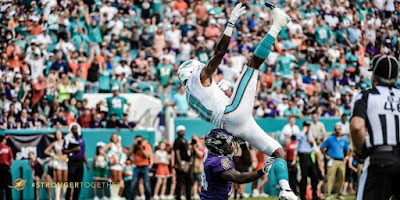 The Dolphins at the suggestion of the tough minded head coach offered-up just 19 pass attempts, and Tannehill completed only nine for a ridiculously low 86 yards that included DeVante Parker's forty yard sprint, leap, and catch in the end zone. Meanwhile; Tannehill today became just the fourth quarterback in league history to throw for at least 3,000 yards passing in each of his first four years, and he is on a 2015 pace to accrue his third consecutive 4,000 yard season. Remember, there are unconditionally loving children watching! 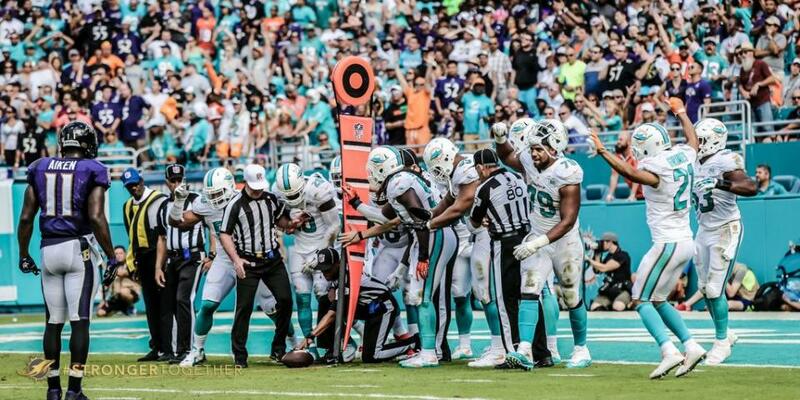 Miami ran the ball 26 times for 137 yards with Lamar Miller leading the way on 20 attempts for 113 yards. Though he did have a fumble on a first and ten from Miami's own 20 yard line (at the end of a 17 yard run) on the Dolphins second to last possession, that led to a Ravens potential game winning 55 yard field goal miss. As Dan Campbell suggested in pointing out (actualities). ""We did what we had to do against a team like Baltimore, we played lights-out defense, and we ran the ball. Yea sure you want to complete more than 9 of 19 passes, but we had a few breakdowns, protection issues, drops that didn't help Ryan, but yea we got to be better. We want to be more productive in the pass game absolutely, but I don't want to watch Ryan Tannehill (one sack though hit a bunch) get his face beat-in back there, so we made sure that that didn't happen particularly versus a team like Baltimore, so we did what we had to do versus such an opponent. Zac did a good job calling the game especially for his first attempt in a good win against a good team. Maybe next week against a NY Giants team on Monday Night Football the game plan will be different. We're gonna be better in the pass game, we're gonna be better, we're gonna have productive plays there that are gonna help us, but I'll tell'ya what, this was the type of game we needed to beat a Baltimore team!"" A week long as well as a during the game rain storm left the field sloppy while both Dolphins and Ravens were flopping all over the field due to traction issues. To end a second quarter opening Ravens drive of nearly nine minutes, and 15 plays that covered 80 yards, Miami's defensive line had no issue with traction. Baltimore needed one half a yard for a first down. With a second down from the Dolphins 2.5 yard line they ran up the middle once, twice, and then a determined third time on fourth down while gaining just 5 inches in three attempts as the Home Team Defense kept the game at zero to zero late in the first half. Just after Miami's near end of the first half twenty second scoring spurt of fifteen points, the Ravens drove 60 yards for a first half ending 38 yard field goal. Baltimore opened the third quarter with a 6 play, 78 yard drive that ended with a screen pass and scamper of 41 yards for a touchdown to pull within 15 - 10. Three Ravens series later they managed a final field goal for a game score of 15 - 13. They missed (through 25 MPH gusts and rain) a fifty-five yard potential game winner with two and a third game minutes remaining. 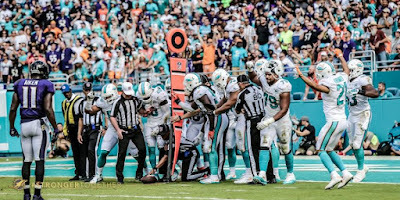 The Dolphins intelligently ran all but 20 seconds off the clock, punted from within long field goal range, and gave the ball to a timeout deprived Baltimore Ravens. The Miami Dolphins Defense stood tall and ended what the mans man, tough guy Dan Campbell referred to as a "Gritty Performance" while he fought-off tears of pride during his post game locker room speech. Thank You for reading, and as always we look forward to your angle of view : )) !! MNF Versus the G-Men, GOFINS! !